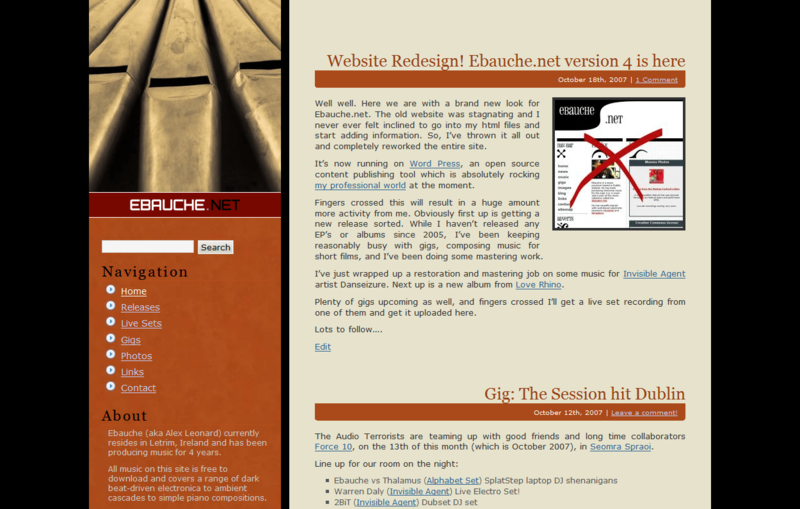 So I've just finished redesigning my music persona website, ebauche.net. I'd love to hear any feedback as I've kind of been doing this in quite an introverted way, which is usually what happens with my own site designs. I've moved the entire website over to Word Press, which is rapidly becoming my mainstay for content publishing due to its huge flexibility and adaptability. The whole site should be validating as XHTML strict, and hopefully should render well in all A-Grade browsers. At some point I hope to sort out a mobile style of some sort that should help it render quickly on phones. Other than that, I've made my first EP available for download (it was only available on Invisible Agent prior to now), and all the other music that I've done is still available through the releases section. Hope you like what you see, and if not, I'd love to hear any suggestions for improving things.